Micro businesses are the backbone of today’s economies and their growth is of great importance for job creation and economic welfare. In India, there are approximately 1.5 million registered MSMEs, out of which 94 per cent are micro enterprises. Among these micro enterprises, 67 per cent are manufacturing units, 17 per cent are service based enterprises and 16 per cent are repairing and maintenance enterprises. The sector continues to register a high growth; provided employment, and contribute to the country’s GDP. Our journey of working with micro entrepreneurs in rural geographies highlights that they continue to be limited in accessing resources for setting up their businesses. While there are multiple agencies, both government and private, that provide enterprise services and deliver a range of services to them, these often remain difficult to comprehend and access – challenging communities in identifying pathways to entrepreneurship. This is primarily on account of a series of limited information flows and low levels of confidence among the stakeholders. The Work 4 Progress (W4P) program of “la Caixa” Foundation in partnership with Development Alternatives aims to promote employment in developing countries by expanding economic opportunities for youth and women who have difficulties in accessing enterprise solutions. The program emphasises prototyping innovations through co-creation and collaborative learning to accelerate enterprise solutions for large scale impact in economically backward regions. Understanding that local economic development narratives need to move from ‘necessity-based entrepreneurship’ to ‘opportunity-based entrepreneurship’– W4P aims to facilitate an eco-system that provides equitable access to information, resources, market linkages and finance that enables communities to unleash their potential. 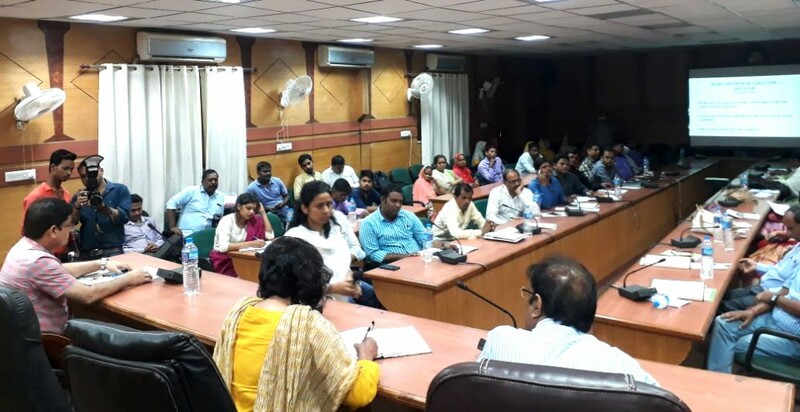 To exhibit that robust ecosystem acting synergistically can enhance successful micro enterprise development initiatives, the program has launched two key prototype initiatives in the two clusters of operations in Eastern Uttar Pradesh (Bhadohi and Mirzapur) and Bundelkhand (Jhansi and Tikamgarh). Regional Coalitions: These are local platforms for periodic dialogue between stakeholders and service providers for co-creation of solutions and, consequently, convergent action for enterprise development. Since the launch, five regional coalitions have been conducted in both the geographies with an identified purpose. A total of 15 – 20 members are actively engaged in both the coalitions. The regional coalitions were launched in June 2017, where the members have agreed to come together on a monthly basis to create an enabling and empowering platform for women and youth based entrepreneurship. The members of the coalition consist of representatives from primary government bodies engaged in entrepreneurship like District Industries Commission, Rural Self Employment Training Institute, NABARD; Financial Institutions like district lead banks and micro finance institutions; market aggregators; as well as academia and civil society organisations. The coalitions have set a mission to set up 500 micro enterprises and create 3500 jobs in Bundelkhand and Eastern Uttar Pradesh respectively through joint action. These coalitions are showing signs of accelerated action, leading to a spike in the number of enterprises setup and supported. Enterprise Fair: Enterprise fairs are created as market places to enable direct contact of entrepreneurs with multiple service providers, to reduce time for delivery of services. Enterprise Fairs have been conducted in both geographies with footfall of close to 150 entrepreneurs and 13 service providers. The fairs have been useful in creating a buzz in the community – helping reach out to a larger footprint of entrepreneurs. These events have been extremely successful in reaching out to a large number of entrepreneurs as they were able to obtain linkages and support services all under one roof. These events are being conducted periodically to help create synergistic initiatives making available increased opportunities for entrepreneurship among youth and women. We believe working in these partnerships will help us identify trigger points to strategically steer the transition from linear, “directed action” based approach to entrepreneurship and job creation to one in which “systemic solutions” are co-created among stakeholders and prototyped for future replication. To foster the kind of socio-cultural changes required to help a pro-entrepreneurship ecosystem, investments in such innovative institutional models will broaden the pool of local job creation as well as the number of people ready to fill them. We hope that this would expand opportunity and lead to more inclusive economic progress.